Blackpool Tower and North Pier are just 200 yards away and the train station just five-minute’s walk. A bright but not flashy option with a fresh and progressive attitude. Family-owned and run. Rosebank Villa is a notch-or-two up on your usual family-run option. Much of the hotel’s success is in the design which makes smart use of space and some modern and attractive colour-schemes. The location is also excellent. The Winter Gardens practically backs onto the hotel, Blackpool Tower is just down Albert Road and the Grand Theatre is also just round the corner. 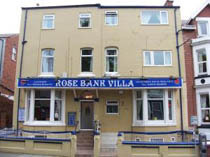 The 19 bedrooms on offer are all en suite and bed & breakfast is offered at some very affordable rates. All rooms feature colour-televisions, free wireless broadband, tea and coffee making facilities and some free luxury showers gels. There is also a Honeymoon suite for recently wedded-couples or folks hoping to rekindle a little romance.